A week ago, I had the opportunity to attend a community meeting focusing on resolving issues between the homeless population of Silver Spring and the broader common-unity. The meeting, which was held in the Silver Spring Civic Center, was convened to stimulate discussion and to increase understanding between the homeless, local business owners, police, and interested citizens. The event was hosted by Hope Restored Inc., a local non-profit which is focused on reducing recidivism and hopelessness by providing options and information to individuals and families experiencing difficult circumstances. I was invited to attend the meeting by community leader Jeffrey Thames, the founder and Executive Director of Hope Restored. I attended with Four Corners resident and contributor Joe Fox, who is an engaged citizen interested in making Silver Spring the best place in can be. Joe and I attended as both interested citizens and as representatives from local blogs. Below is the official synopsis of the event from Hope Restored, which Jeffrey Thames has graciously allowed me to publish here. I will include the full summary, and add a few of my own thoughts at the end. On August 19, 2014, Hope Restored, Inc., convened a meeting to address the issues of individuals experiencing homelessness in downtown Silver Spring. The meeting was held at the Silver Spring Civic Center Great Hall. There was over 85 people in attendance with 62 individuals officially signing in. Here's a topic I've been meaning to write about for a while: the gravel streets in the Indian Spring neighborhood. I have been curious about these streets ever since I was a little kid, when I would go to the adjacent "fire engine park" regularly (side note: every park should have one of those jungle gym fire engines). The two streets are signed as Long Branch Parkway and Biltmore Drive, and the gravel sections are one block south of East Franklin Avenue next to the headwaters of Long Branch Creek and the synonymous park. The streets are next to each other, and they almost connect at their respective dead ends. Seven homes directly front these gravel roads. I know the answers to many things Four Corners, but this one stumps me. I do not know a reason why these two sections of street are unpaved. However, I have several theories as to why these roads are the way they are. My first guess was that perhaps these two blocks are just alleys, and therefore do not require a paved surface. However, these two blocks have several homes facing these gravel streets, something alleys do not usually have. These streets also have normal names and street signs, which is something else that alleys often lack. Even if these are alleys, one would think that the surface should be paved since there are multiple homes fronting each road. The 9300 block of Biltmore Drive. Photo by the author. A couple of days ago, I saw a comment thread on the Woodmoor/4 Corners Facebook group in which a few people recounted memories of a military installation in Four Corners, which was said to be in the vicinity of Northwood High School and Caddington Avenue. One person said that they thought it might have been home to an anti-aircraft battery or missile site of some kind, perhaps part of the Nike missile program. Another said that installation seemed to have been decommissioned by 1956 or 1957, and that the land was turned over to a developer who built the homes that currently stand in the area. During the Cold War, the military erected missile sites around all major U.S. cities as part of Project Nike. Similar to the Civil War forts a century earlier, these missile sites formed a ring around the nation's capital to protect is from enemies. While the Civil War forts were built to defend against the Confederate Army, the missile sites were built to intercept long-range Soviet bombers laden with nuclear weapons. The missile sites were located in what was then the countryside, since the goal was to shoot down any planes before they reached densely populated areas. The locations of these missile sites are well documented, and information about them can be found easily online. 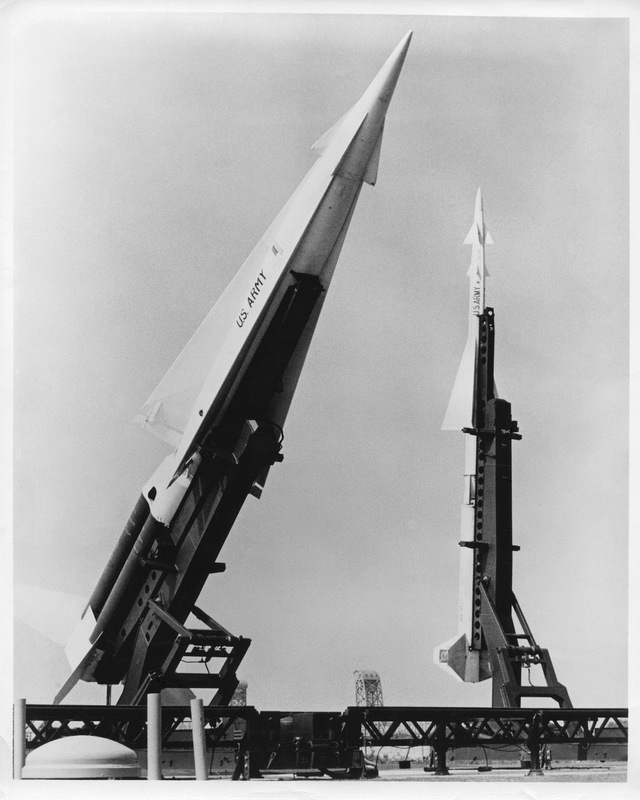 Nike Hercules (front) and Ajax (back) missiles. Did we have these in Four Corners? Photo from Robert Sullivan on Flickr. When I first heard that there may have been a missile site or another type of anti-aircraft battery in Four Corners, I was skeptical. As stated, the missile sites that comprised Project Nike are well documented, and in some places there are historic markers denoting their locations (the Lorton site has one such marker). Also, most Nike missile sites were much farther from the city than Four Corners. The closest documented missile site to Washington D.C. was in Upper Marlboro, about 16 miles from the Capitol building (Four Corners is only 9 miles from the Capitol). I was fairly certain there was no missile site here, but multiple people had said that there was some kind of anti aircraft battery in Four Corners, so I knew there had to be something there. To investigate, I decided to take a closer look at a 1957 aerial photo of the area which I own, and I found something very interesting. 1957 view of the Northwood neighborhood depicting a small military base. University Boulevard is the road running from bottom center to top left. Northwood High School is at the very top of the image (a portion of the track is visible at top right). Back in 2007, the Maryland State Highway Administration reconfigured the interchange of University Boulevard and the Capital Beltway. The project eliminated a dangerous "weave" zone on the Beltway by eliminating the ramp from westbound I-495 to eastbound MD 193. Traffic was shifted to the ramp that had previously only been for westbound MD 193 traffic, and a traffic signal was added to facilitate left turns onto eastbound University Boulevard. When the project was completed, the old cloverleaf ramp was closed and torn up, leaving several acres of empty land covered with grass and scattered trees. View of the area from University Boulevard looking towards the Beltway. Photo by the author. A while ago, I bought a 1958 D.C. Transit map at the National Capital Trolley Museum. I initially thought the map would only depict routes in the District, so I was pleasantly surprised to find that it also showed suburban routes, along with descriptions of where each bus route went. Four Corners has had bus service since the 1940's, years before the formation of WMATA (Metro) and a long time before Montgomery County created Ride On. The service was originally run by D.C. Transit (formerly the Capital Transit Company), the private frim which ran the buses and streetcars in DC and the Maryland suburbs from 1933 to 1973 (Metro was formed in 1967 but D.C. Transit was not eliminated until 1973). Below is an inset map depicting routes in the Silver Spring area as of March, 1958. Bus routes in Four Corners and surrounding areas in 1958. Routes in white text with red background were regular routes with service throughout the day. Routes with red text on a white background were express routes/rush-hour only routes. Image from map printed by the National Capital Trolley Museum. Montgomery Planning has published this interactive map of proposed and existing bikeways across the county. This map appears to have been published within the last couple days, and it depicts bikeways that are proposed under the Countywide Bikeways Functional Master Plan, as well as those proposed under local plans. Some of the bikeways proposed on this map are included in our 1996 Four Corners Master Plan, while others appear to have been added which were not in the 1996 plan. Bikeways proposed in and around Four Corners. Red dashed lines indicate proposed shared-roadway bicycle facilities, green dashed lines represent proposed shared-use paths along roadways. The solid green line around Blair is a proposed on campus ring path. Click here for full map.